Many patients who suffer a type of heart attack known as an ST-elevation myocardial infarction (STEMI) are treated in the intensive care unit (ICU), despite a relatively low risk of developing a complication requiring ICU care, according to a new study published in JACC: Cardiovascular Interventions. A STEMI is caused by a blocked blood supply to the heart and is the most severe type of heart attack. "In recent years, treatment for STEMI patients has improved so much that cardiologists have seen the risk of developing a complication requiring care has significantly decreased," said Jay S. Shavadia, MD, a cardiologist and researcher from Duke University Medical Center and the Duke Clinical Research Institute and the study's lead author. "We wanted to quantify the risk and see whether ICUs are being overutilized for STEMI patients." 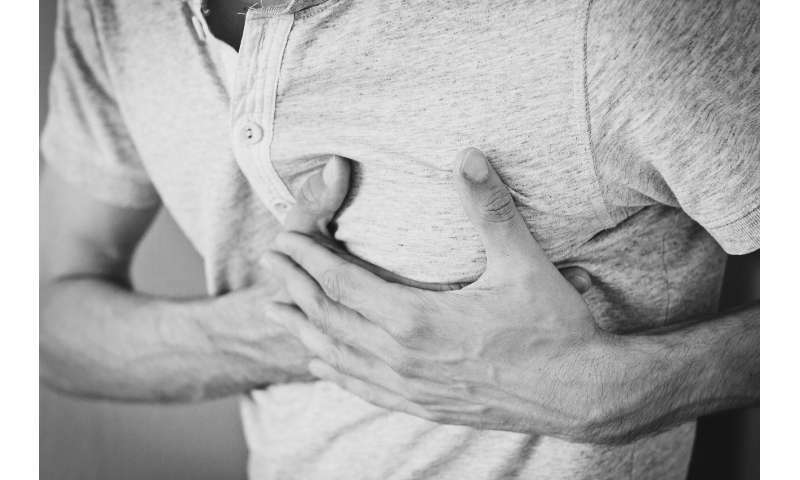 The researchers analyzed data from the Chest Pain-MI Registry—which includes patients admitted to participating hospitals with STEMI or non-STEMI (NSTEMI). They examined patterns of ICU use among STEMI patients ages 65 years and older treated with PCI who were stable when they were first seen in the hospital. This meant they were not in cardiac arrest, were not in shock or had had a procedural complication. "We know those patients [with shock] need to be in an ICU, so we didn't include them in the study," he said. Of 19,507 stable STEMI patients treated at 707 hospitals, 82.3 percent were treated in an ICU with a median one-day ICU stay. Overall, 16.2 percent of patients developed complications requiring ICU care while hospitalized. The study found 3.7 percent died, 3.7 percent experienced cardiac arrest, 8.7 percent experienced shock, 0.9 percent suffered a stroke, 4.1 percent had a blockage of electrical signals between the heart's upper and lower chambers (atrioventricular block) and 5.7 percent experienced respiratory failure. These complications were not limited to those related to heart problems. "As patients get older, their risk of non-cardiovascular complications requiring an ICU stay increases, such as other causes of shock or respiratory failure, sepsis for instance," Shavadia said. Patients who waited longer to receive treatment were more likely to develop at least one complication. Those who received treatment within an hour of being evaluated by emergency medical service (EMS) personnel or going directly to the hospital without being seen by EMS, had a complication rate of 13.4 percent, compared with 18.7 percent for those who were not treated for at least 90 minutes. "Although 16 percent is not a small number of STEMI patients who should be in the ICU, we found the majority of patients don't need to be there," Shavadia said. He said that patients age 65 years and older are more likely to develop complications than younger patients, so the overall risk for STEMI patients of all ages who need ICU care may be even lower than 16 percent. The study did not address which stable STEMI patients will need ICU care. "We're now trying to identify which patients are at greatest risk of complications, so we can predict who needs to be treated in the ICU," Shavadia said. In an accompanying editorial, Suartcha Prueksaritanond, MD, and Ahmed Abdel-Latif, MD, Ph.D., of the Gill Heart and Vascular Institute and division of cardiovascular medicine at the University of Kentucky, and the Lexington VA Medical Center in Lexington, Kentucky, wrote, "The high ICU utilization pattern despite declining complications following PPCI [primary percutaneous coronary intervention] calls for a new approach. This is particularly important as the overall health care cost continues to grow and calls for optimal resource utilization prevail." They noted that until a more comprehensive, simple-to-follow algorithm for stratifying risk in STEMI patients is developed, "the ICU admission decision for STEMI patients will continue to be based on individual judgment and traditional protocols rather than robust and evidence-based risk prediction models."